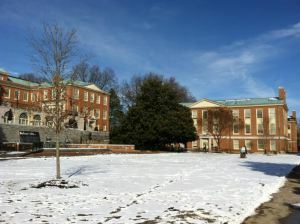 Today’s snow-blanketed Wake Forest University campus. How does Conor O’Callaghan seamlessly connect a snowy North Carolinian landscape, James Joyce and voicemails? Ripe with isolation, introspection, recovery and renewal, O’Callaghan’s latest collection, The Sun King, whispers secrets and sings the emergence of light born of the soul’s darkest moments. Technology flashes in and out of The Sun King, yet O’Callaghan’s words never suffer from it. In fact, his 21st century wit, cynicism and sensibility, (delicately balanced by raw emotion and tantalizing craft), is only strengthened by his surrender to an ever-increasing technological landscape. I called up Tech and got the voicemail code. It’s taken me this long to find my feet. Since last we spoke that evening it has snowed. Fun fact: Many of the poems that comprise The Sun King are set in North Carolina–O’Callaghan lived in Winston-Salem from 2005-2007. Perhaps in direct response to Simon Armitage’s acclaimed “Five Eleven Ninety Nine”, which recounts a bonfire at the end of the 20th century, O’Callaghan’s “Three Six Five Zero”, despite being palled in snow, is a combustible conclusion to the collection. It sings the birth of the 21st century and speaks directly to a generation fawned by technological intervention and globalization. that’s blanked out by my leaving. It had snowed. Lately others’ pasts will turn me cold. I heard out every message, pressed delete. I’d happily forget my voice, the mail, its code. The Sun King is a cathartic eruption of wit and grief, a collision of light and darkness that is easily O’Callaghan’s finest volume yet. Order your copy here.